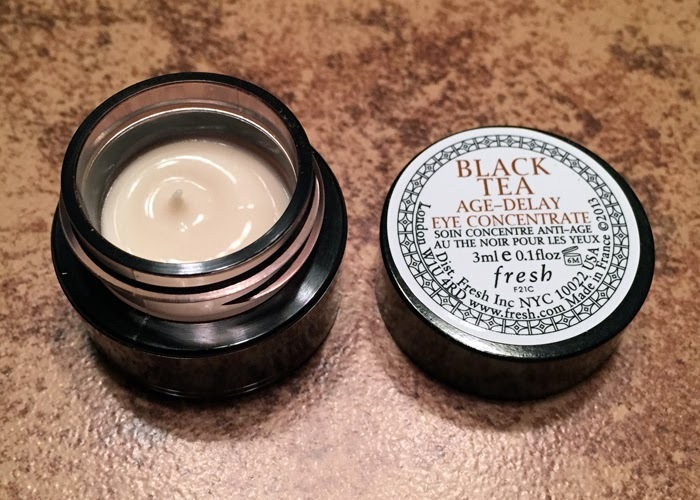 THE SKINNY: Black Tea Age-Defy Eye Concentrate is a nice moisturizer for that tender around-the-eye area, but it doesn't do much else. That makes the $85 price tag a little hard for me to swallow. The moisturizer from fresh uses black tea, blackberry leaf extract and lychee seed to create a rich moisturizer that didn't irritate my eyes. It seems to work just fine. But I want more from an eye cream, especially one with a hefty price tag. I'm like millions of other working adults who don't get enough sleep. My fight is less the fine lines and wrinkles and more the tired eyes with dark circles. If I'm going to pay $85 for a moisturizer, I need it to help me look brighter and awake. fresh says this moisturizer is "cooling" and will do that, but my sample failed in that area. On the plus side, a little bit of this moisturizer goes a long way, so the little pot of lotion will last forever. CHECK IT OUT: fresh says to use Black Tea Age-Defy Eye Concentrate after cleansing day and night. Use with Black Tea Age-Delay Serum and Cream.